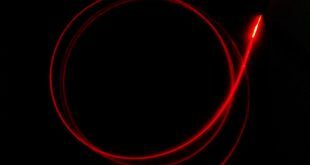 β-particle is a charged particle that interacts with matter in several ways depending on its initial energy : mainly ionization process and Bremsstrahlung process. When β-radiation crosses a matter thickness, it releases completely or part of its energy due to collisions with atoms; this phenomenon depends on the initial β-energy and on the crossed material density. 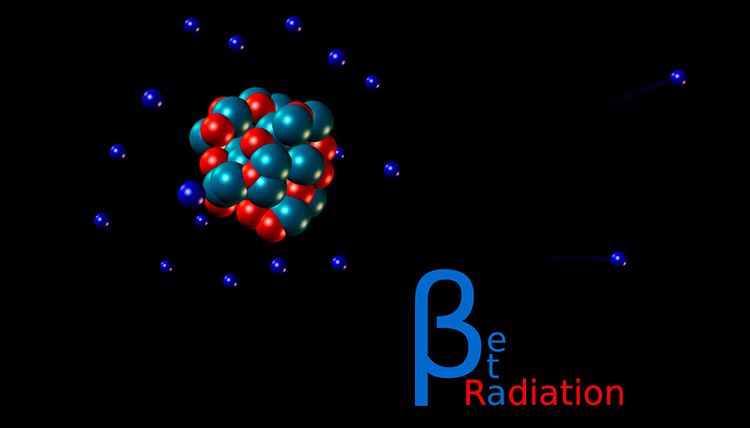 Beta particles are less massive than alpha particles and only carry a charge of 1e; consequently, beta particles can appreciably penetrate many potential shielding materials although their penetrating capacity is considerably lower compared with γ-rays. The transmission of beta particles is frequently calculated in the same fashion as that of gamma rays, where the mass attenuation coefficient is defined by the slope of the exponential function. It must be taken account that, due to the fact that the β-particles with lower energies are less penetrating hence they are completely absorbed at smaller values of thickness, the initial decrease of the absorption curve is too rapid to be fit by exponential function. Thus we can try to calculate the absorption coefficient. To obtain the probability for scattering in a length x of some material, we consider an incident flux per unit area I0, I(x) represents the flux at a distance x into the material. S(E) is the linear stopping power. From the above equation the mean range can be calculated and it results that it is proportional to the mass of the incoming particle, inversely proportional to the square of its charge, and inversely proportional to the electron density of the stopping material. Where E is the initial kinetic energy of the electron (in MeV). The experimental setup is based on the SiPM – Plastic scintillator detector, already described in the post SiPM & Plastic Scintillator. The plastic scintillator is especially suited to detect light charged particle, such as electrons, while it is not so sensitive to γ radiation. Thus it is perfect to detect the β radiation emitted by our source. The source is made of 0,1 μCi isotope Strontium 90. As can be seen from the image below the beta decay of strontium 90 gives rise to the emission of beta particles with maximum energy of 0,546 MeV and the subsequent decay of the yttrium 90 generates particles with maximum energy of 2,28 MeV. We did the measures simply by putting the source just on the detector with and without shielding, in order to measure the range and the absorption coefficient. in the image below the measurement stand is shown, without any shield and with an aluminum shield. 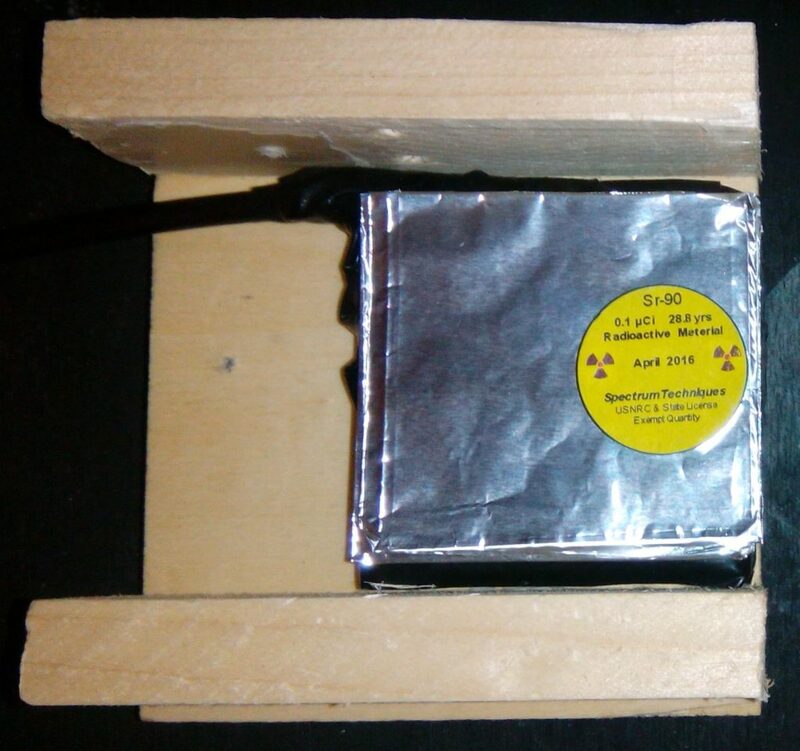 Thus with an aluminum shield with thickness more than 0.5 mm we should be able to stop all the beta particles coming from the Sr90 decay while most of the particles coming from Y90 should have enough energy to pass the shield and reach the detector. 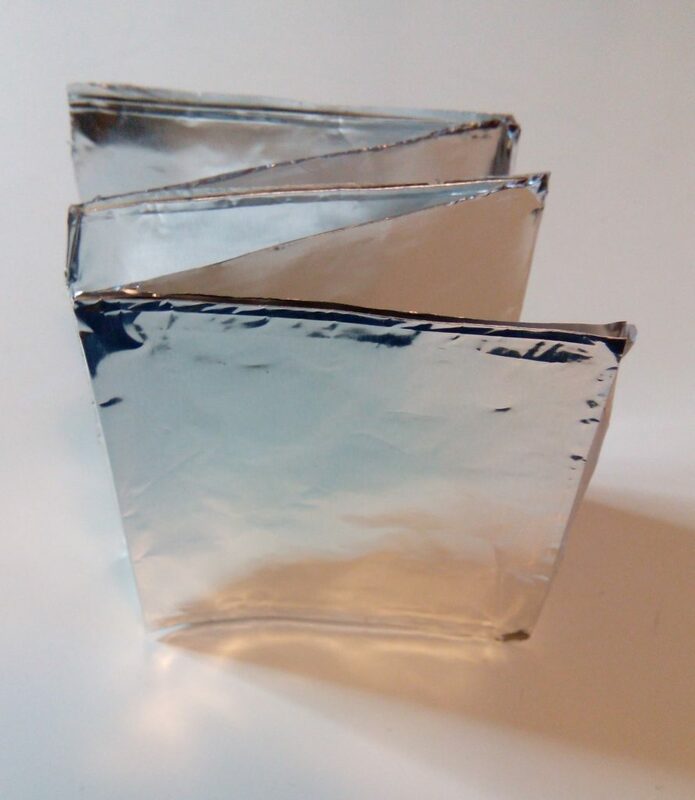 To obtain an aluminum shield with the proper thickness we used normal kitchen aluminum foil with 16 μm thickness : 45 layers give a thickness of 0.75 mm, as shown in the image above. 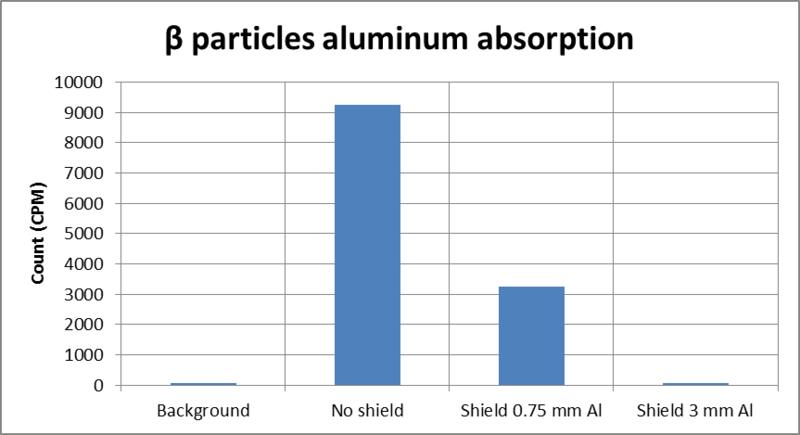 The chart below shows the measurement results with no shield, with 0.75 mm shield and with 3 mm shield. 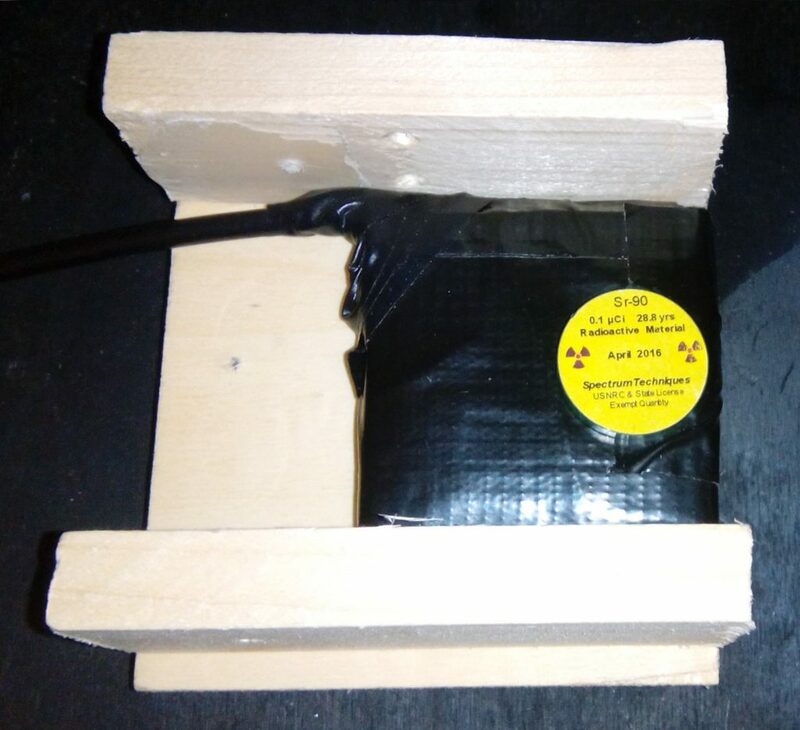 The obtained results are in accordance with what was expected : with the 0.75 mm shield we are able to stop slightly more than half particles (all the Sr90 particles and part of the Y90 particles), while the thicker shield cuts away almost all the beta radiation. 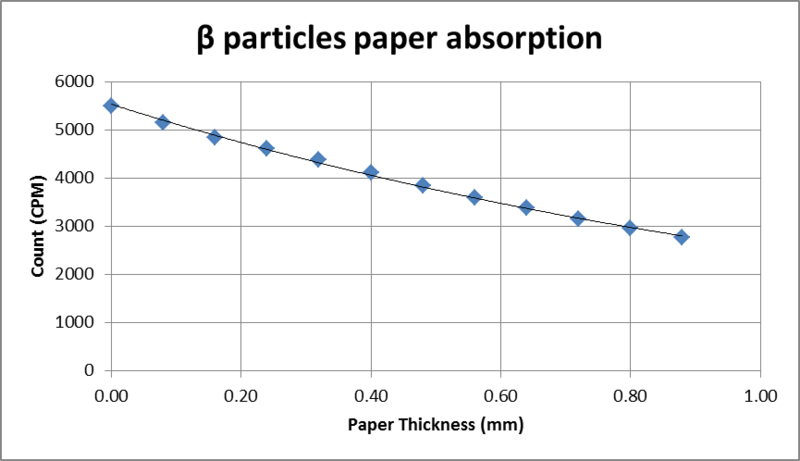 Beta attenuation represents a golden standard in the quality control of paper industry and in the measurement of thin layer thickness. We try to use the same technique to evaluate the beta absorption in paper sheets. 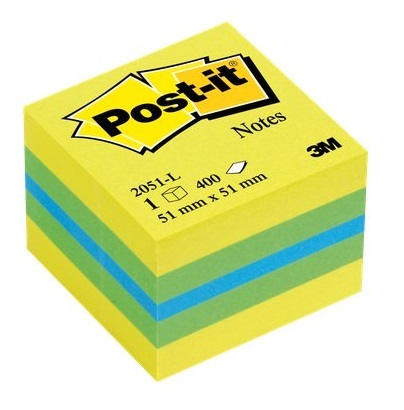 As paper sheets we choose Post-it notes. We put an increasing number of sheets between the source and the plastic detector and we measured beta counting rate in CPM. The thickness of the Post-it should be 0.08 mm so, with the data, we obtain the following chart with an exponential fit. The fitting is good and the possibility to measure with ease the thickness of thin paper layer is proved.